SAVE THE DATE! The Vapour Lounge 4 Year Anniversary Party is on Saturday, October 15th from 1-7PM! It's that time of year again and as a huge thank you to all of our family, friends, and loyal customers, we're throwing a PARTY! Stop by The Vapour Lounge on October 15th for LIVE MUSIC, FREE FOOD FROM THE IN-N-OUT TRUCK, AND MUCH MORE! We will be announcing more details in the days and weeks to come so stay tuned to our social media feeds for updates. We apologize, but do to new laws the party this year will be limited to people 21 years & over. Hi Vapour Lounge Family! The holiday season is upon us and that means it's time for some great deals! Whatever your plans are for this weekend, be sure to stop by The Lounge for our Black Friday event. Everything, and I mean EVERYTHING, in the store will be on sale! If you're going to start your shopping excursion early then we have some fantastic DOORBUSTERS for you! Just a heads up, the deals on the Kangertech NEBOX and Joyetech eVic VTC Mini are only available for a limited time. So if you want to take advantage of these discounts then I suggest you be here when we open our doors at 11 AM. All the other deals will be going all day while supplies last. From everyone here at the Vapour Lounge, we wish you a very happy and safe Thanksgiving! See you on Friday! 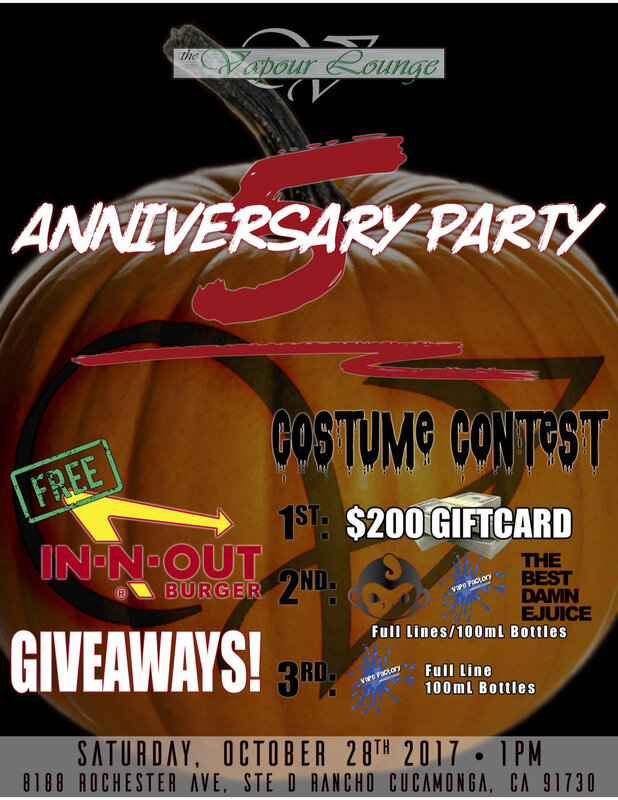 Our 3 Year Anniversary Party is Going Down on October 17th! Our 3 Year Anniversary Party is less than two weeks away so it's time to release all the details. We're going to have tons of giveaways all day, high end hardware raffles, live music, free food from the In-N-Out truck, a $2000 Trick Comp, a $2000 Cloud Comp, and lots more! This year we have more support from big name brands than we've ever had before! This year we are excited to have giveaway donations from: Blue Label Elixir, Miss Demeanor Elixirs, Midas Vape, Villain Vapors, Vaping Monkey, Vapelyfe, CK|S, Local Vape, Uncle Junks, E-Cig City 4, Buckshot Vapors, Epic Juice, Stella Vapor Co., and many many more! There are no fees or requirements to participate in the giveaways. All you have to do is show up, eat some free In-N-Out, enjoy the live music and hopefully win some free stuff! This year we are proud to announce that our raffles will benefit the local Rancho Cucamonga Animal Shelter. To receive a raffle ticket all you have to do is bring in one pet item donation, such as: pet food, pet toys, litter, blankets, and etc. Each item that you bring earns you one free raffle ticket. So the more items you bring the better your chances are of walking away with an atty or mod from one of our high-end hardware manufacturers! Following the popularity of last year's music lineup, we're bringing back Skunk Dub to play their smokin' hot reggae jams for the Vapour Lounge Family! There will be live music playing the whole day and Skunk Dub will be playing two full sets. There will also be live performances by OKT and Eleventy. The performances this year have been made possible thanks to Tazz at Audio Morpheus. It wouldn't be a Vapour Lounge party without the In-N-Out truck! The Vapour Lounge has picked up the tab for the food so your Double-Double, Animal Fries, and Chocolate Milk Shake are free of charge just like they were last year! All we want is for you to have fun with us and spending money is not a requirement for that. This year is gonna be insane so we hope to see you and your whole crew at The Vapour Lounge 3 Year Anniversary Celebration!! !